If you’re not using Skype as part of your small business, you’re missing out on a huge opportunity to save money and streamline telephone communications. This software is free and comes packed with features including instant messenger, file sharing and free video/audio calls to other Skype users. For me, Skype has been indispensable and was one of the first business tools I started using around 2011/2012. If you’re in the early stages of business and cash is short, Skype is a life line, not just a phone line! If you’re using a laptop, you might be able to use the built in microphone to talk, but it will not be a very good experience for you or the person you’re trying to talk to. One way to get good sound quality is to invest in a cheap USB microphone headset. This is a good option because the boom mic is always near to your mouth and helps you maintain “proximity”. In 2015 I bought a Audio Technica ATR2100 USB/XLR mic and have been able to use this with Skype too. It is a cardioid polar pattern, meaning it won’t pick up any background noise and only records the area immediately in front of the mic. By contrast, the headset seems to pick up everything in the room. One of the first things you can do is purchase Skype phone credit which is added to your account and lasts until it is used up. There’s no expiry date. You can call other phones, send SMS, or have calls forwarded to your mobile phone. In my experience, it is NOT cheap to call mobile phones from a Skype phone system, despite what they say. A one hour Skype call to a mobile phone cost me nearly £10! If I’m calling a landline number from Skype, the cost is reasonable and you might make a £10 top up last months. The cost of calling a landline works out at pence per minute, with a small connection fee added depending on whether you or not you have a Skype subscription. If you use pay as you go, call costs are more expensive. However, if you don’t make that many outbound calls, you can stick to the PAYG top up system otherwise you’ll be paying for calls you never make. You can read about Skype call charges on their website. If it is a mobile phone I need to call, I’ll call off my iPhone instead, using the included minutes from my mobile tariff. It works out cheaper to call other mobile numbers this way instead of using Skype. You cannot call emergency numbers from Skype, so keep that in mind. Another advantage to having Skype credit is the ability to send SMS. This neat feature can act as a backup in place of your mobile phone. If your regular mobile phone is lost or has a flat battery, you can send a text message through Skype at a cost of approx 6 pence. Without a doubt, the best feature of Skype is being able to take incoming phone calls from outside phone lines. In order to receive calls, you must purchase something called a SkypeIn number. The phone number is a subscription of approx £50 annually or the payments can be broken into quarterly installments. Callers phoning your Skype phone number are charged at a local rate. There are some frequently asked questions about the online number here. 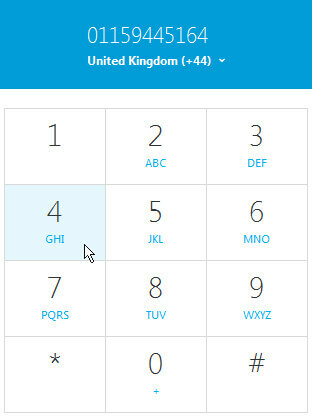 To register a new phone number you first need to get a Skype account and download the software. When you register your phone number you begin by choosing an area code. Once you’ve chosen an area code, you’ll be taken to the next step where a set of available phone numbers will be displayed. An online number is cheaper than the average telephone line rental. I do not have a BT landline subscription because you’re looking at something like £16.99 a month just for the line rental. The only disadvantage to using a Skype phone system is being dependent on having an internet connection in the first place. 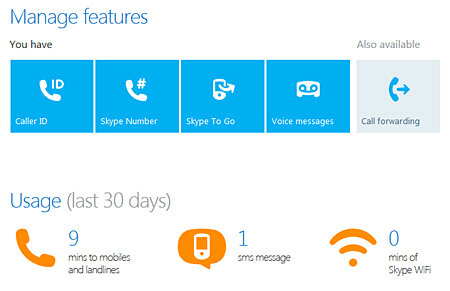 If your broadband becomes unavailable (or if your PC is turned off) the caller will be forwarded to Skype voicemail. It is possible to purchase multiple phone numbers that all forward to the same Skype account. This would be good if you wanted to use different area codes in newspaper adverts promoting your services to particular cities/towns within a particular region . Potential customers phoning your business Skype number would only have to pay the local rate of the number. The cities you want to operate in each have their own telephone area code. Therefore you could purchase three separate phone numbers which all have their own area code. 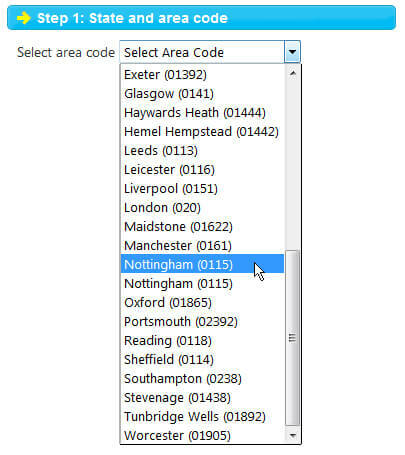 This is potentially attractive to customers from those cities because they will recognise the phone number as being local. Unfortunately, Skype doesn’t provide a way to track multiple numbers in a single account, so tracking the effectiveness of each phone number printed in ads is tricky. You’d have to set up separate accounts for each online number you purchase. If anyone has any thoughts on how to track SkypeIn phone numbers effectively, please share your ideas. There probably IS a way but it might involve buying separate mobile phones and forwarding the Skype numbers to these phones. Every time I get a nuisance call I block the number permanently. You do this by right clicking the number that called and choosing Block. Obviously, if they call from a withheld number this is not possible but the feature is handy for blacklisting pesky telemarketers. It’s possible to run multiple instances of Skype on the same computer. You can sign into different accounts and use the same headset with different accounts. 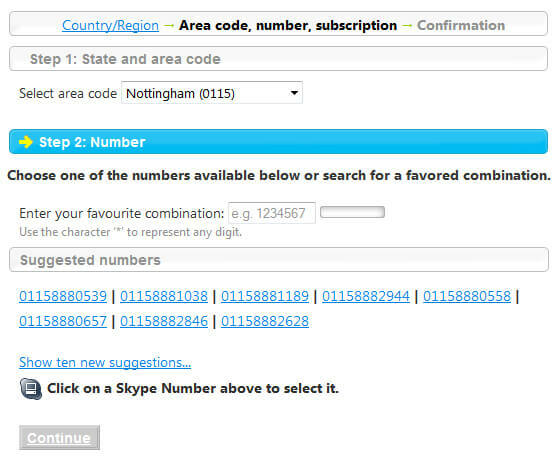 It’s very handy if you’ve set up different SkypeIn phone numbers for each account. If you’re not signed into Skype when somebody calls your number, they will have the option to leave a voicemail (which is free to set up). 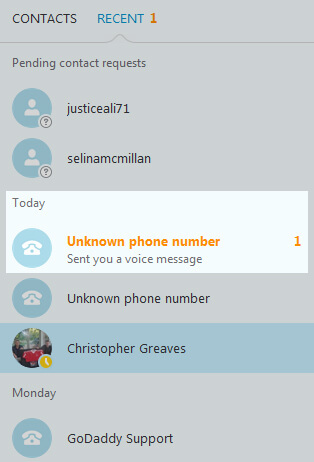 When someone leaves a voicemail message, you’ll be alerted through Skype as well as receiving an email letting you know. If you have enabled call forwarding, the person phoning you will instead be able to talk to you on a phone you’ve configured to receive calls. It’s a handy solution for certain situations, such as if you are away from your computer and not able to pick up calls through Skype directly. Many people set up the forwarding settings so they redirect to a mobile phone. Beware though – you’re paying to receive calls if you do set this up. If you’re the kind of business that attracts lots of nuisance calls/time wasters, forwarding might not be such a good idea. It’s possible to talk to people in your contact list totally free. Just click their name and select Call Skype. As long as the internet connection is good, the audio quality of the call is very good. Try not to run lots of other apps/programs on your computer when talking over Skype. Shut down all unneccesary background operations and the quality of the call will be higher. 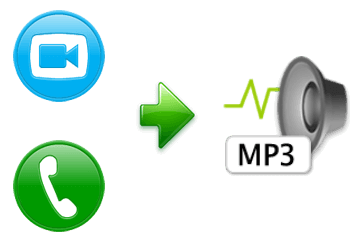 It is possible to record voice calls as an mp3 using the Evaer app. This is a paid third party plugin for Skype capable of capturing what is known as system audio. The Skype sound quality is very good. Whether you’re having a telephone conversation or a Skype audio conversation, the audio from both sides of the conversation can be captured in stereo sound, with either voice on the left and right channels. Using an audio editor such as Audacity or Sony Vegas, you can tweak the recorded sound levels. One of the best things about Skype is the live video screen sharing. It is possible for yourself and another Skype to view one another’s screens. 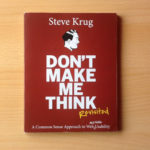 You can use this to discuss projects, give consulting sessions or troubleshoot computer problems. The instant messenger program works the way MSN used to, letting you send and receive files. 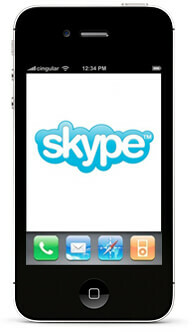 There is a free Skype app for the iPhone. You can do the screensharing over the phone too, but it is inferior to the desktop PC version. You may have noticed many online providers do not make it easy to download a .PDF receipt. 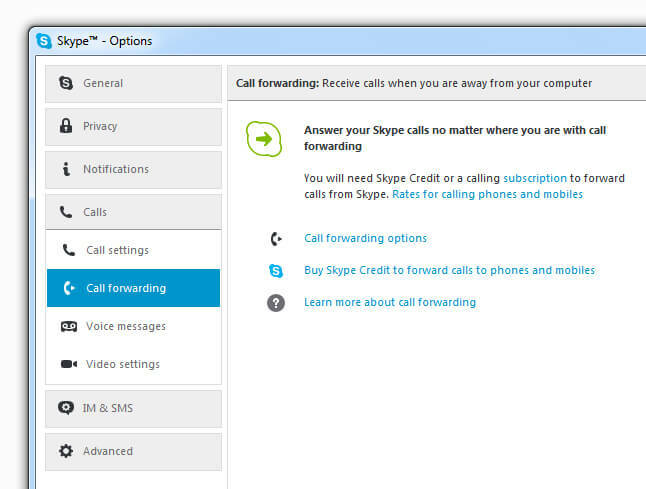 Skype is among the many online vendors not giving an easy option to download one as part of its website functionality. 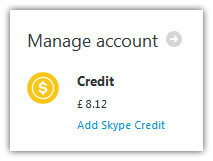 I always obtained my invoice number by visiting Purchase History inside the your Skype account section of their website. It was a case of just adding the Skype ID and Invoice number to the URL and then pasting the entire URL into my browser. Immediately I’d get a browser prompt to download the PDF. 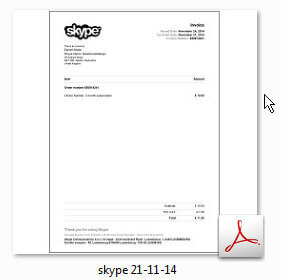 Skype have changed something on their end so that this PDF download functionality doesn’t work. Lots of customers have been complaining. My new method involves using the internet browser printer settings to select the text I need and either print it or save it as a PDF. Skype occasionally updates your software to the latest version to improve call quality and fix bugs. You may be required to log out and restart the software, so do this if it prompts you.